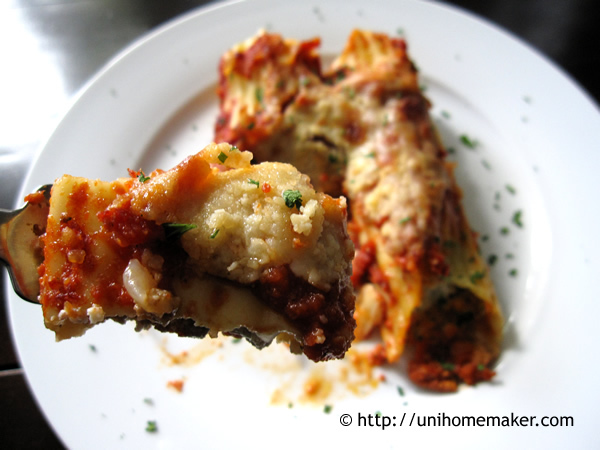 This was my first stuffed pasta recipe I learned 5-6 years ago, and it has been a staple in my household whenever we wanted something hearty in the form of pasta. I have to admit, this dish does take some time to make but it’s totally worth it! Plus, it can feed a lot of people if you are casually entertaining. The trick to stuffing these tube pastas quickly and maximize the stuffing in each tube is with a demi spoon. You can cram a lot in there and in a flash. Add a simple salad and you have yourself a meal! In a medium skillet over medium high heat, add ground beef, onion and a drizzle of olive oil. Season with salt and pepper. Cook until beef browns and onions are soft, about 5-7 minutes. Add in minced garlic. Remove from heat and let it cool. 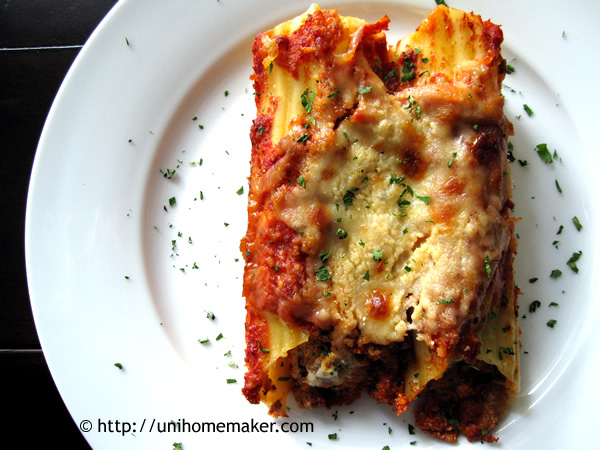 Cook manicotti in a large pot of salted boiling water until slightly soft, about 5-7 minutes. Brush a large baking sheet with some olive oil and transfer the manicotti from the pot to the oiled baking sheet to cool. In a large bowl combine ricotta cheese, 1 cup of mozzarella cheese, 1/2 cup of grated parmesan, parsley and meat mixture. Stir to combine. Brush olive oil in a 9″ x 13″-inch glass baking dish. Spoon 1/4 of the jar marinara sauce in the bottom of the prepared baking dish. 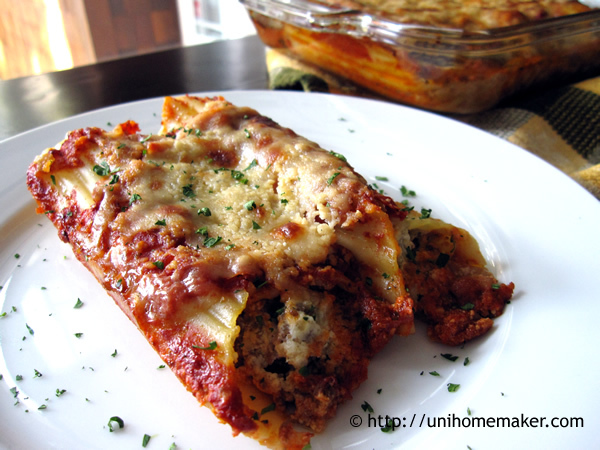 Fill manicotti with the meat and cheese mixture and arrange the stuffed pasta in a single layer in the baking dish. Spoon the remaining marinara sauce over. Sprinkle the remaining 1 cup of mozzarella cheese, then the remaining 1/2 cup of grated parmesan cheese over the stuffed pasta. Dot the entire dish with butter pieces. Bake the manicotti uncovered for 30 minutes and boil it on high for 1-4 minutes to brown the top. Let the manicotti stand for 10 minutes before serving. Optional: sprinkle some chopped parsley on top before serving. I’ve never had stuffed pasta before, and really want to tuck into your dish right now. 😀 I love stuffed pastas. If you like ricotta cheese then you’ll really dig stuffed pastas. Wonderful comfort food. Looks really delicious, and the photos are great! Thank you so much Darya! 🙂 And thanks for taking the time to stop by. I would like try it ,i never had something so delicious.Anne,gorgeus!!! This is real comfort food, love your photo, will make when the kids come home. Yes! I know this dish. How can I not, as an Italian it is one of our dish especially on special occasions. You got me hungry. I think I’ll be making some soon. Thanks for the idea. I haven’t made either manicotti or stuffed shells in soo long. This recipe looks so delicious!!! Thanks for posting it – and I’m gonna “Pin It” for sure!! ChgoJohn – I just started following your blog! And I agree – great minds often do think alike!! Twice recently I either made -or was planning to make – something similar to what a fellow blogger posted!! it’s dinner time and I regret looking at your post now because I am starving after seeing your photos! This is such a great recipe! You’re too kind, thank you Danny! 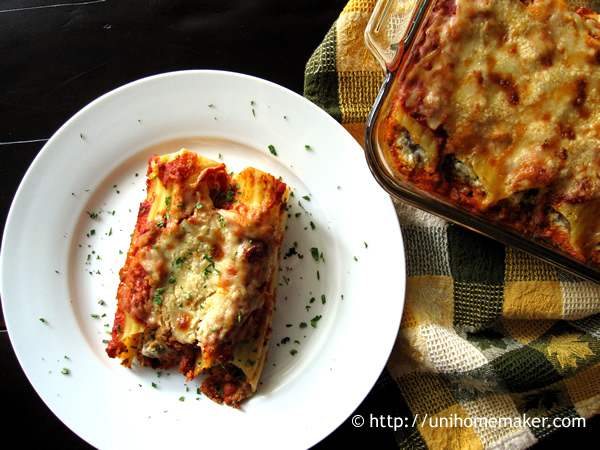 I’ve never heard of manicotti but this looks gorgeous. A lovely, homely and very tasty pasta dish. What a gorgeous classic dish! I’ve always had a hard time stuffing it, thanks for the demi spoon tip! Maybe I’ll give another try. 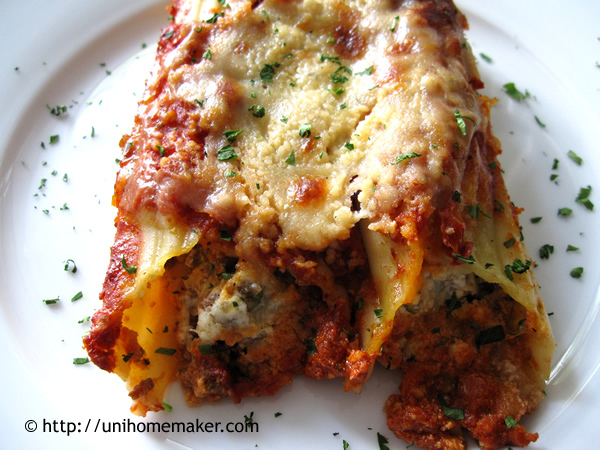 Question – I’ve seen recipes where people have used lasgne pasta and just wrapped it around the filling. What’s your feeling on how this would change the dish? I don’t see a problem using lasagna pasta instead of tube pasta. It would be called a completely different dish though. Great idea! Would be shorter than a manicotti tube but as far as taste I doubt it would be that much different. Thanks Jan! I’m glad the demi spoon tip helped. I know I had a hard time stuffing too when I made these the first time. My dear Christina! How lovely to hear from you. 🙂 Thank you for taking the time to stop by today. Big hugs to you and I hope all is well. xoxo! I love manicotti. This looks hearty and delicious. I really love manicotti. Looks so scrumptious. I love stuffed pasta and this looks decadent. Perfect comfort food for me. 🙂 I’ll try your trick with stuffing these with a spoon. Thanks for sharing. Hi I like your blog and enjoy reading it everytime I visit. Hence I have nominated you for Very Inspiring Blogger Award. Your acceptance is totally optional and depends on your wish to join in or not. Thanks for passing this on to me. Congrats to you on your nomination! MMMM! Your meal is looking freaking delicious here! I had to pin this one.